Bird Spikes are an excellent low profile bird deterrent system for use on ledges, parapets, signs, beams, chimneys, cutouts, security cameras, lights, etc. The Bird-Flite bird spikes we offer are a humane bird spike with blunt tips that prevents injuries to both birds and unsuspecting maintenance workers. 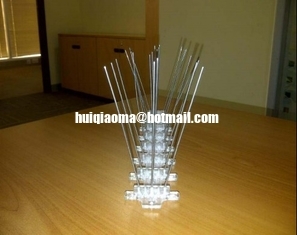 Our bird spike bird control product consists of thin, stainless steel rods and a clear U.V. resistant polycarbonate base for long-lasting durability while protecting against target pest birds. The diameter and spacing of the spikes make this bird spike the least conspicuous bird spike on the market and avoids entrapping debris as well. Install Bird Spike Bird Control Products: In any bird pressure area. 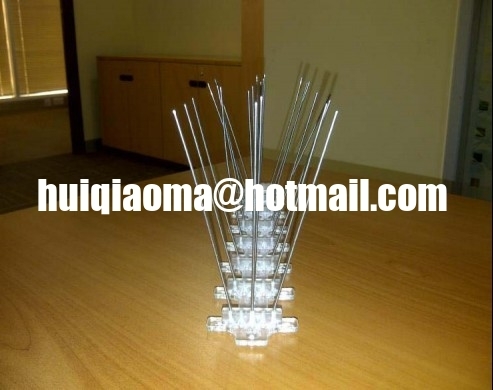 Bird-Flite bird spikes can be used to protect ledges, parapets, signs, beams, chimneys, cutouts, security cameras, lights, column tops and more from roosting pigeons, gulls and other large problem birds. Material: U.V. resistant polycarbonate base with blunt-tipped, stainless steel rods. Ease of Installation: Easy. The bird spike base can be glued or screwed into place. The one foot lengths are scored for easy break, accommodating any architectural configuration. How It Works: Pest birds such as pigeons and gulls like a flat surface to land on and bird spikes like our Bird Flite prevent them from landing to gain a foothold. The bird spikes flexible base allows it to conform to both flat or arched areas, making it a very effective bird control product for use in areas with differing bird pressure, such as a protected ledge underneath a sunny overhanging parapet.